So I was just flicking back through my last few posts (I know, I know, I’m an egomaniac) and I noticed that it’s been a really long time since I’ve posted a workout – let alone a HIIT workout – on here. Kind of awkward, given that it’s a fitness blog, right? Well. I’ve decided to rectify the situation, starting with this little 10-minute burner. 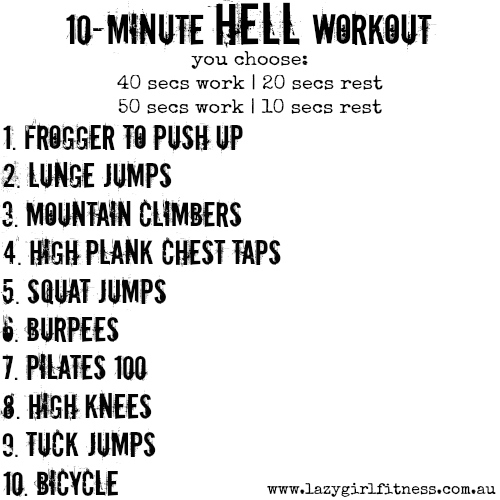 I like to bring this quick HIIT workout out when I want to burn some big calories and I don’t have a lot of time to do it. It’s great because it requires no equipment and minimal space, so I can punch it out in my living room. It’s pretty high intensity and designed for the more experienced athlete (yes, I’m calling you an athlete!) so please keep this in mind and always be safe – modify exercises where necessary and consult a doctor if you have any concerns. Save the image to your phone and pull it out next time you need to burn some big calories, fast! Have a great weekend, Team. p.s I’ve included some videos of the less common movements below, in case you’re unfamiliar with them. If you’re confused by them (or any other exercises on the blog), let me know! And don’t forget to join my YouTube channel, so you’ll have access to the library of exercise videos anytime you need them! « Do You Recognise These Excuses for Skipping a Workout?